AVENGERS 3: INFINITY WAR YOUNG GAMORA POP! VINYL AVENGERS 4 - ANT MAN (TEAM SUIT) POP! AVENGERS 4 - BLACK WIDOW (TEAM SUIT) POP! AVENGERS 4 - CAPTAIN AMERICA (TEAM SUIT) POP! AVENGERS 4 - CAPTAIN AMERICA POP! AVENGERS 4 - CAPTAIN MARVEL POP! AVENGERS 4 - HAWKEYE (RONIN) POP! AVENGERS 4 - HAWKEYE (TEAM SUIT) POP! AVENGERS 4 - HULK (TEAM SUIT) POP! AVENGERS 4 - IRON MAN POP! AVENGERS 4 - NEBULA (TEAM SUIT) POP! 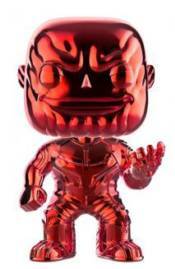 AVENGERS 4 - RONIN MASKED POP! AVENGERS 4 - THANOS 10-INCH POP! AVENGERS 4 - THANOS POP! AVENGERS 4 - THOR (TEAM SUIT) POP! AVENGERS 4 - TONY STARK (TEAM SUIT) POP!